Set of 50 reusable elastic bowl covers keeps foods fresh without foil or plastic wrap that never fits right! Elastic bowl cover grips various bowl sizes. No more transfers from bowl to bowl to refrigerate or reheat. Set of 50 plastic food covers: ten each of five graduated sizes approximately 6", 7", 9", 11", and 13". OPENED YOGURT CONTAINER HALF A LEMON OR GRAPEFUIT COVERS WERE GIVEN TO ME TO TRY OUT BY AN ELDERLY AUNT AND I FINALLY FOUND MY OWN SUPPLY. It never fails is that you have something to put in the refrigerator which needs a top. Since it was used as a serving dish, do you really want to transfer to a tupperware/rubbermaid when a simple bowl cover would work? Plus you can wash them, rinse them and let drain on a papertowel. Love the sizes and use them all the time instead of aluminum and saran wrap. i was going through a lot of plastic wrap, and these covers have replaced nearly all uses. for the cost of 2 rolls of wrap i have enough covers to last years. do not microwave. The name says it all. I cover all leftovers. They are clear so I can see at a glance what is inside the container. I have bought similar item at the dollar store but these are more sturdy. Very easy to wash and use over and over. I love I can put leftovers in a bowl and cover it with one of these and still see what is in it. I have used these at times for something different however. I will wrap them around bottom of a plant container so it holds a little extra water to keep plant from drying out so quickly. Works really well to store extra water when watering them. I have bought these before a long time ago and eventually the elastic will wear out, so I am buying new ones for me and a package for a friend, who doesn't remember these from her grandmother's kitchen. I do! These are great to use, wash and reuse rather than using up plastic wrap. I have even used one of these on the open end of a sliced watermelon. Works great. These are so much easier than plastic wrap, and can be used with all kinds of storage items, including that little bit of gravy, or one hamburger patty. They can be washed with soapy water. This is my 3rd set! Have used these for years! My mother had these in the 1950's before plastic wrap was available. Although made of different material, they are still as useful today as then. I use them when a water-tight seal is not necessary or desirable. While making gingerbread houses, we had every decoration in a different bowl, using every bowl in the house. So we didn't have to close down for the day and put everything back in small bottles, we covered each bowl with one of these covers. Worked like a charm. I have kept seeds for next year in small bowls with these lids. No spilling parts when building flat-packed furniture. These lids work perfectly. I am always finding new uses for them. Only downside? They used to also sell the huge ones for casseroles and such. They are no longer available. Hope they come back soon. Very practical product; it is reusable, it fits different size containers, and it is reasonably priced! I breed and train show dogs, and puppies can be picky eaters. These bowl covers are handy when making and keeping multi-puppy batches, then reheating in the microwave! I was tired of fooling around with the plastic wrap and decided to go back to the forties and get the elastic covers again. They are easy to clean and let dry and I love them. I am 81 years old and used them when I was a girl. Great to use for a picnic, you can throw them away when you are all done with the picnic at the park. Lots of different sizes. Elastic looks like it will hold up for some time. Easy to clean. Best use of this product is for the dishes that don't have tops. The price was awesome for 2 sets and have plenty to last me. I'm very happy with this product; it's a must have!!!!! My family loves these "shower caps" to store food. The variety of sizes means that there is a cap for almost every container. No more tangled, nasty, wasteful plastic wrap. They wash beautifully and keep for quite a while if you aren't too rough with them. I love these covers. I reuse them if they did not cover meat. These covers are great, quick, fast, reusable, compact. We refer to these as our food shower-caps. So easy to use.Just slip one over a leftovers bowl and stash in the fridge. Rinse and use again and again and again. Save a lot of money on plastic food wrap. Worth every penny. I had some of these many years ago, used for years, just washed & reused, they finally wore out. So was nice to find again and so many sizes & package of 50. These are a lighter plastic than the old ones but will service the purpose & last long enough. It is so much nicer to fit these over bowls for left overs than using saran wrap. I can even use on rectangle & square bowls. I really like using these! Food stays covered and nothing drys out. I will never use foil or plastic wrap again! I use them to keep foods fresh when putting them in the frig. They're flexible, strong and durable. I have used other bowl covers; These are very strong and durable; the best I have found! I have been looking for bowl covers for some time and finally found them. They are exactly what I wanted and do the job I need them to. The price is right and the product is great for covering a wide variety of sizes and shapes of containers. They are easily washed and reusable for a number of times. Thanks. Love my plastic bowl covers for when you have left overs ! I've put off buying these for a while but immediately put them to use. sorry I waited so long! There are sizes you can use on half empty tin cans, so you don't have to take the stuff out of the can to store it. There are sizes for small bowls you use for serving small amounts of things like salsa. And there are large sizes for bigger bowls. You don't have to dirty up dishes just because you need to store something. Instead of using plastic wrap that doesn't seal properly, I keep these handy to use. They last a long time. I just rinse them and reuse. I also give gifts of bakegoods and they work well over bowls or even platters. I always have them on hand. Great to cover something when you don't have a cover. I have no complaints. I've ordered them before. Love them. You can see what is being covered. They can be washed several times. Love them! Had to buy more ! It's the best cover for the fruits in the refrigerator. I had recommended it to all of my friends. I'm lazy these are easy!!! I hate doing things in the kitchen ... the Messi do in there the better ... these things are tailored just for me couldn't be easier!!! Just like my mamma used to use. Always handy, work on any container. No more searching for lids.. I wanted a way to stop using so much cling wrap and foil. These fit nicely over plates and bowls. I just rinse off any food that gets on them, and they're ready to go again. These are a great invention...no need to scramble finding another lid....Great for transporting food, keeping it fresh or just everyday use. Easy on & off! A great thing from the past is back! So easy to use. Much better than plastic wrap. I use them, wash them and use them over and over again! I have used these plastic bowl covers for years. They also make good misc.type gifts. The covers last a long time and are very durable. The price of these covers make them a very good bargain. Perfect Fit For Any Size!!! It seems like I can never find the right lid for my storage containers! Not anymore with these elastic edge bowl covers! Various sizes allows these covers to fit almost any size storage container. These covers also allow visibility to see whats in your containers so you don't have to open every bowl to see whats inside! I definitely recommend these for anyone who eats leftovers! Love my elastic edge bowl covers!!! I use these covers for any leftovers. They come in several sizes so there is always one that fits most bowls or plastic containers. They cling much better than plastic wrap. My mom used a similar product years ago. Sometimes the old ideas are the best. Prefer these bowl covers to the plastic wrap as they are much easier to cover and stay on. Can even use them in the micro wave oven. Great bargain, 50 in a pack!!!! I love these and they last a long time. I have been using these covers for years. They come in the right size for my use and last through many washing. Great value for the price. Several sizes included in the assortment -- from covering a mug to covering a dinner plate. I use them primarily in the microwave to reheat food or drinks. The covers stretch quite a bit if you're careful and are fairly durable. In some cases, they can even we washed and rinsed out by hand and used again. This is the second time I've purchased a set of these from Miles Kimball. I can cover any bowl I have and can be used severl times. It saves me using plastic wrap that can only be used once. I would tell anyone to get them. I gave some to my dauther in law and now she is going to get them. We both can't do without them. Also makes it easy to transport foods without spilling. These are a great way to cover leftovers in bowls without lids. Keeps food fresh and secure in the fridge. "Holy cow what a food saver"
In a larger family such as mind lids from bowls get missed place or lost and when I happen run across this website, I immediately order several. I'm telling all my friends and family about this left over food saver. This is a great product that I use everyday. They also save space that ordinary lids take up in my cupboard. Product is just what I expected. Works great! I use these covers especially when I have an unusual size like a loaf pan (for left overs), needs storing; foil doesn't fit tightly and saran doesn't always stick. I also use them in place of all the original covers I have lost or damaged over the years and still have the containers. These are great to cover dishes that you plan on using soon. You don't have to find the "right" lid. Just pull one of these out and use it. these really save you money on groceries because you can save leftovers and cover even the smallest bowls to save on space. they are really helpful. Excellent product all kitchens must have. I relly am glad I purchaseed these covers. They are handy to have around. I'm the worlds worse for losing tops to the containers. It doesn't matter now I have these covers. I gave a few to my son. He's as bad as I am. He loves them too. My mother used these when I was growing up. They are great for putting left overs in the refrigerator to use later. I never could find these and now I finally found them. Thank you. Whenever there is leftover food that fits in a bowl or even on a plate, these lids make a great cover to go in the refrigerator or cupboard. These bowl covers are very versatile, reusable, and very convenient with 5 different sizes to fit almost any bowl. My mother had these years ago. They are hard to find and I am pleased to have these. They fit snug,and don't come off like some plastic wraps. They wash well. I am very much pleased! your bowl cover sizes are so versatile. Wish I'd ordered these years ago! I remember my mother using these in the 40s. They were washed and used over and over again. Now I'm doing the same..... don't know what took me so long to order them. I have a ton of Tupperware and other great products but I also am a little bit of an antique bowl shopper/user. I ordered these covers for my "odd" sized bowls and my misc. mixing bowls. I LOVE them. They are so versatile and with a little cleanup they can be used over and over. They are also very reasonably priced. Well worth every penny!!!! Great for bring food to parties. I love these for covering leftovers. I've ordered sets for my father's 2 apartments and just re-ordered for myself! Beats searching for that illusive lid for old Tupperware storage containers! these covers are the best of the best. they come in handy when you've run out of foil wrap. These bowl covers work just like they are supposed to! I use these on all sizes of bowls. That's the reason I bought them. just what we need. You do have to hand wash, which isn't hard to do. I love the different sizes. I've used the small for canned milk in the fridge. Large for putting over cake/pies or weird shaped containers. I have a big plastic fish container I serve watermelon in. These bags pull over and fit snug. Keeps everything fresh and great for hauling food for holidays. I put them in mesh bag and toss them in laundry - hang dry. i REALLY LIKE THESE. SO HARD TO FIND IN THE STORE. YOU CAN USE THEM OVER AND OVER. THEY ARE SO INEXPENSIVE FOR AMOUNT YOU GET, YOU CAN USE, WASH AND USE AGAIN AND THEN THROW THEM IF THEY GET FOOD ODOR ON THEM. I use these covers on bowls that I don't have kids for. They are wonderful. I transported my apple-pinapple pie yesterday using one of the COVERS. How neat is that??? Hard to find these and at MK price I can gift all my in-laws. I've been looking for these covers for quite a while. With so many in the package, I'll never have to buy another. I use these covers to keep left-overs fresh in the fridge. They can be used over and over after rinsing, The many sizes make them versitile. I use these to cover everything I previously covered with plastic wrap - bowls, plates, etc. They are easy to wipe clean and dry quickly. I imagine I will save a bundle by not purchasing as much plastic wrap, and feel like I'm doing the planet a favor. You get more than you need, and can share with friends. A great product! Love the covers and they're green, too. These are so much better than any plastic wrap to cover leftovers of all sizes and shapes. You can uncover, remove some contents and then pull the cover back over the container. They wash wih a quick swish in the dishwater. I had been looking in stores and was thrilled to find them in your catalog. I use to keep my foods fresh in the refrigerator, no odors from other foods gets in and the is no hard top on the food when I go to use it. I use these covers for hard to fit bowls and pans all the time. They can be reused but if they get really messy I just throw them away. They are safe on the top shelf of the dishwasher which is a real plus. I recommend these to anyone who has hard to fit bowls and pans. These are just great....better than plastic wrap which never sticks! Bought them at a discount store the first time and never could find them again....then, I found them here! EXCELLENT DEAL! Bought an extra set for my mom...she was so happy I could find them! Plus, u can use in the microwave as well. Fast shipping too. My grandmother and mother used these types of covers for years. I really like them especially when taking foods to potlucks....you bring back your bowl with or without food but covered...no trying to keep track of your aluminum foil or plastic wrap. Also, due to the many sizes, you can cover everything from a relish dish to platter of meat. Easy to use, easy to clean....and they don't take up a whole cupboard of space. Besides that, you don't have to go digging for the right size of lid for your container....just keep them in a grocery bag...and you are set. These are wonderful, they used to have these in the grocery store but stopped carrying them, my entire family was SO sad!! These are wonderful, I use them on everything from open cookie dough to covering bowls. The press and seal wrap is awful! These even work to cover sodas!! I have purchased these before and loved them.No more having to use plastic wrap.So many sizes for what you need to cover.No hassle trying to tear off the plastic and get the right size,it is already to go. Easier to cover odd sized pans than plastic wrap! These bowl covers are good to have for covering food in bowls that do not come with lids. If any lids are missing or damaged you'll always have a replacement when you purchase this package. I had enogh to share with my sister and mother! These are great! They can be washed over and over again. I have been searching for this type of product and was very excited to find the covers and especially on sale. I received them very quickly and have already started using them. These are just handy to have for a quick bowl cover. The variety of sizes are nice too and you can't beat the price. No Household Should be Without These! These covers are just about the greatest gift to civilization since the wheel. Well made, they are definitely durable and easily cleaned for re-use. The wide selection of sizes is a real plus; generally there is no problem finding just the right one for the job at hand. I admit there are not as many uses for the very smallest size, but there are times when they are just the ticket. Believe it or not: as little gifts they are really appreciated by those who have not had the pleasure of having them with their very useful and easily stored household widgets. Not just for kitchen use, for sure! A great item, reasonably priced and highly recommended! Just love the ease of using them. I remember my mom using these when I was young; So glad to find them. I purchased these for each family this Christmas and all want to know where I bought them. Definitely will purchase more when the time comes. Can't imagine trying to run my kitchen without these wonderful covers. They are very economical to use and the clear tops let you see everything you have stored using them. I use these all the time for covering leftovers, covering half a melon. This is my second order, I do find the 'elastic' wears out quickly. And they could use an extra size between the smallest and the next size.. The covers can be used for covering paint cans. It seems I always have plenty bowls but no covers that will fit them. These covers are very handy to own and use. I would recommend them to anyone that wants a cover that has multiple uses. My granddaughter says, "They look like shower caps!" I have been purchasing these bowl covers for years. Can't ask for any better cover-up for storing multiple sizes of bowls that need refrigeration. They can be washed and reused or tossed. They are terrific! Such a quick way to store anything! I just love love love these things! They offer an easy way to store leftovers and they stretch nicely to fit nearly every average bowl. The only thing wrong with them are they are flimsy. So I use them once maybe twice and throw them away. It says you can wash and reuse but I'm not convinced they get clean enough to reuse more than twice but the price is so reasonable I buy several sets! They are really handy and I love them! I have nothing uncovered in my fridge anymore. Smaller ones are great when storing bowls in the frig. Largeer ones are great when carrying a dish to a pot luck dinner or picnic. Also bouoght a set for my sister and a friend. The product is great for covering left-overs. I love the product. This is my second set of these handy food covers. They work well and are easy to use. I wouldn't be without them. They are not a new idea, I am 81 years old and my mom had similar ones. To cover almost everything left in a cup, bowl or plate. Shower cap for larger ones. great to slide a cover over leftovers then to use all the other expensive plastic wrap.My mother has always used these and you learn what works the best from the best. GREAT TO KEEP LEFTOVERS FRESH AND IT CAN BE USED MANY TIMES. WE HAD A FAMILY MEETING AND THEY LOVED THESE COVERS SO I PLACED AN ORDER FOR THEM AS THIS IS A HARD TO FIND ITEM. I love these. Have not found them cheaper. I use them when I'm entertaining to prepare the food. When guests arrive just lift the cover. To store leftovers, pop a new cover on. SOme say they wash the cover and reuse it. I don't. I've bought this product several times and definately recommend. The plastic is light-weight but seems like it should last a while. CAME QUICKLY AND WAS EXACTLY WHAT I WANTED! these elastic bowl covers are very nice to have. I use them for covering up containers while entertaining. I use these to cover leftovers, salads, juice pitchers, etc. I also use them to heat things up in the microwave. They keep odors where they belong. They keep things from drying out. They don't seal but they aren't meant to. I think they're great. I would buy this product again. Well made. I use this item for storing and on the go items. Very well made and worth the money. Some of them I have used over and over again. These covers are great! I freaked out when saran wrap quit making them. But now I want to throw the old colored ones out and just use these made better and see thru ones. Bowl covers, really like using them, saves food from spoiling. Love them. Wouldn't be without them! Quick to grab one, cover a bowl of leftovers and stick into frig! Looked in stores and couldn't find what I wanted. Found it here and am very happy I ordered them. They fit many different size bowls so that is a plus and there are a lot of them so I am probably good for a long time. Been looking for these for a long time. Used these years ago and been looking for them again. Always relied on them to keep food fresh. I use these covers day in and day out and have for years. They come in sizes that work on virtually every bowl in my kitchen. They are great for coverig everything from rising dough to leftovers for the fridge. they are also great for covering food to be served at room temperature. These are nice but the seal does break easly. I really love these bowl covers. When I find others at the store, you get very few covers and the price isn't that great. MK is the only place I've been able to find these. I even buy them for my mom because she loves them as much as I do. I definitely wouldn't use them in the freezer, because I don't think they would protect the food very well. They are reusable, which is a plus. I enjoy having these so much easyer to grab one of theses, compared to searching for the lid. I saw these at a home over the holidays and I just had to have them. The lady didn't remember where she went to get them, but I went on a search and found them here at Miles Kimball. I love them and they are priceless. I sent a set to my mother and she loves them too. I USE THESE ON EVERYTHING I LOST A LID FOR. THEY ARE CONVENIENT AND REUSABLE. It is easier to deal with leftovers now. a long time. They are great! It's nice to see whats inside the bowl without taking the cover off. These covers are very useful! These covers work so well. I gave some to my daughters and they realy like them. Covers like these are hard to find. Have bought extra sets for my daughters. I've been needing something to keep my leftovers fresh, i have bowls, etc., but don't have covers for all of them, so this was the answer to my problem. Thanks so very much! Hadn't seen these in years! "I'll buy this product again, I liked ! "I'll buy this product again, I liked and my friends too. Just received these bowl covers. There are a lot of them in all sizes to fit just about any bowl. They're good quality, not flimsy, and the elastic seems like it will last and not stretch out quickly. Definitely a good purchase! I LOVE LOVE this product. They're economical, they are clear and you can see the foods through the plastic. Wouldn't want to ever be without these! My mom always used these rubberized tops long before plastic wrap or storage containers. I STILL prefer these tops because they fill so many more needs once you always have them on hand. I am glad they are still available! If I want a couple of slices of tomato for a sandwich, one of these toppers safely store the cut tomato until next use.I use them the same way for a sliced onion. The search is over, I finally found it. I use them for left overs, it's fast and easy to put them on containers, they do not come off like saran wrap, all sizes makes it nice. An Inexpensive way to keep food fresh! I was putting one of my treasured bowl covers on some leftover party food while my good friend from the UK was watching. She asked what they were because she had never seen them across the pond. Of coarse I had to order more because mine went on a trip. They are just so handy. Love these covers--so easy to use! Cover open pitchers. Cover anything sitting out on cabinets to keep tops sanitary. Cover dishes of food in the refrigerator for short term coverage. Bought this set for a friend who used hotel shower caps for bowl covers. She loved the set. These elastic edge covers are the most convenient, easy to use and versatile items in my kitchen. They work equally well for storage in cupboards or refrigerator and are excellent for microwaving. Excellent product. I love these different size bowl covers. Very useful to cover lots of different things. Attractive looking in the frige. Leftovers and marinate meats and potatoe salad and others salads. I orderd a set for each of my daughters. They love them! There so handy for left overs. No more hunting for the right bowl cover!! This is my second time buying these. Use for almost all leftovers. Everyone asks me where I bought them. So much easier to use than plastic wrap. they store easily and are easy to use. I can never keep track of tops of bowls and these take care of that problem. I have looked for these for a very long time and when I found them in your catalog, I was so excited. I use when can,t find the lids to my tupperware type containers and liddless bowls. These bowl covers are as necessary as aluminum foil used to be. I have a drawer filled with them, separated by size, and use them every day. I have also used them to cover casseroles or salads that I give to friends and family...and I never ask for them back, since I know the person receiving them will love their convenience and usefulness. When the covers get soiled, I put them in a small perforated laundry bag and add them to my next wash. When they are clean, I hang them up on a rack to dry. So simple and easy. Thank you, Miles Kimball, for providing this very handy product to help make cooking and storing a joy instead of a chore. I use these to cover my dinner plate if I don't eat it all in one sitting. Cover food dishes as I'm preparing other sides to go with the meal. Seal off very well. I often have food leftovers and putting this plastic cover over the plate sames me time so I don't have to look for a wrap. I bought these for my daughter who requested them as she remembered my using them when she was young. They can be hard to find, which is a shame in this age of green-thinking. I like that they greatly reduce the need for plastic wrap which can be used only once; these wash and re-use. People wanting to reduce their 'footprint' should seriously consider investing in these. I have been searching for years and years for bowl covers like we used to have when I was growing up. Reusable bowl covers were used to cover food containers and were not only much easier to use, but were cost saving and saving on the environment. It is so good to have a plentiful supply that perfectly fit over dishes of left over foods, etc. This generous supply should last a while. Thank you. These covers are difficult to find in such varied sizes and with such secure elastic. I can't imagine having a kitchen without an ample supply of these covers handy and the price is very economical. My grandmother had these when I was little. I think they're great and are easy to use and no fumbling with plastic wrap. Wash in soapy water and let them sit out to dry. Reuse a thousand times. These are great food covers ,and easy to use. I hate to be out of these! I have ordered these twice; each time I wondered how I ever managed without them before I found them. I love the different sizes and the compact storage in the drawer. No more fussing with plastic wrap that won't cling to the bowls. These products are great because they are re-useable and cut the use of plastic wrap by a bunch in our house. They do wear out - the little elastics go limp - but, generally, they last a year or more. these covers save your precious dollars by not having to by foil or wrap. they also save our land fills. These put lids on everything, even pitchers when you are outside. What a great thing for leftovers you cover them and they are ready for the next day consumption. I even recommend these as stocking stuffers for family members. They will find uses for them too. I'm always happy to save a little money and keep leftovers from going to waste. I've used plastic bowl covers for years....I remember my mom using them back in the 50's. These covers are washable, reusable, and very durable.....much more economical than buying plastic wrap. Bowl Covers are fantastic time savers. I call these shower caps for bowls. They are wonderful and much easier to keep and find than lids. I have bought several for gifts. This is much easier to use than the plastic wraps. I use these constantly. I can use one a couple of times but then the elastic stretches and/or they rip. But I keep ordering more!! I OFTEN DON'T HAVE LIDS ANYMORE AND THESE REALLY HELP. I use the largest ones constantly. I probably won't use the smaller sizes much, if at all. Wonderful Product and helpful too! It is great for covering plates of leftover food and bowls. Much cheaper the Ziplock bags. Top a bowl or plate to slip into the fridge and you can see what's under it! So inexpensive that if you don't feel like giving it a quick wash - pitch it. Very convenient time saver. My grandma used to use these before plastic wrap. Bought these as one of the gifts for everyone in the family - all of us (wives and husbands) cook. The small covers are even perfect for when I open a can of milk. I love these, I have been ordering these covers for years,also send my daughters covers too. The handiest thing I own! Everything about them is good and the hardest is rinsing them out (Use paper towels). I bought an extra bag to split between my cousin and friend..they love them too! Great Product, I Love Them! I use these for everything from covering half of a lemon, watermelon, canteloupe, etc. to covering bowls, dishes, etc. I have purchased these for everyone I know! I use these to cover everything in a bowl or casserole or dish. Potato salad, cookies, brownies, cranberry sauce, leftovers...just to name a few. Quick and easy, easy, easy! I wouldn't recommend them if you need very tight sealing. Overall, I love these and have a hard time finding them. Thank you for making them available! I use mostly in the fridge in place of plastic wrap. I feel like I'm helping the enviornment because they are reusable after washing. They're quite handy. Just too bad I can't use them in the freezer. I've been finding these pretty handy for pre-setting up a little buffet-type table, and storing leftovers in odd-shaped containers with no [proper] lids. The really teeny one is good for a cup of something leftover, but the biggest isn't big enough to cover a serving plate ---and I wish it was. As an added bonus, the bigger sizes could do double duty as showercaps. works like it should. Easy to use. Priced right. I love these covers, much quicker to cover food than plastic wrap that doesn't stick well. One problem I have is that they should be color coded according to sizes. It would be easier to recognize when stored together in a pile. There are some companies who do color code them and it is so much better. Very handy as a quick cover for leftovers when the bowl they fit in doesn't have a cover. Keeps the refrigerator air from drying out the contents. Comes in all the right sizes. Food cover. 2nd time I bought this item, so it must be useful. These are so handy, when I am using a throw away aluminum container to take a dish to a dinner, shut-in etc. Nothing sticks to those containers but these cover nicely and no big deal if they don't get home. The ones for casseroles etc. are very unique. Most of mine have been hand washed and hung to dry time and time again. this product was just exactly as described, the only negative may be that I did not need 50 of them. They fit any size container, extremely easy to use....I have arthritis in my hands and these don't present any problem for me. I'd been looking for these for quite awhile and Walter Drake made my day when I found them. My family uses it a lot to cover leftovers in plates or bowls. It is easy to wash and dry and reuse. Great find, have been looking for these for a while. I have been searching for this type of cover for sometime. My old heavy plastic ones are finally wearing out. These are ment to be disposable but you can reuse after a quick wash and dry. Covers all my glass bowls from fruit cup or ramekin to large mixing bowl. 50 should last several years! love them. they will fit the top of most containers not matter the shape. they are clear so you can view what is inside without opening the container. had these befor but, they were all small. this assortment has several sizes . is much more useful. can be used as shower cap. I LOVE THESE COVERS. WE HAVE ALL SIZE BOWLS, SOME WITHOUT COVERS. THESE ARE HANDY TO GRAB AND INEXPENSIVE TO USE SO THROW AWAY SOME WHEN THEY STAIN. Great for quick covering of leftovers, although not for long periods of storage in refrigerator. Can also be used to cover food at outdoor functions like BBQs. Yes, I would definitely buy this again!! I use them for my round bowls that do not have lids to put leftover food in, and they are good to use when traveling out with a dish!! These reusable bowl covers are the perfect "green" solution for food storage in the refrigerator. Just wash and dry if necessary before using again. A complaint is that it is hard to distinguish the different sizes. Color-coding by size would eliminate this problem. "It's a helpful product "
It's a good product. It keeps food fresh and no smell in the fridge. Like the fact that I can cover items that are larger or taller than the bowl or pan. I remember these from long ago and they are so handy. Just pop them on a dish and it's covered. I would like them to offer just the large ones for a package too. But I have used a lot of them and will probably buy more. I hate trying to get my plastic wrap to stay on a dish. Very nice product. Easy to use. Convenient. I woud like a few more larger ones. No more mad lid hunts! These elastic edge bowl covers are great. They are very easy to use and even kids might be more inclined to cover food before putting in the fridge. They aren't spill proof but they do offer protection in the fridge and even for picnics as they keep out pesty flies so that leaves more time for eating and less shoo-flying. And one of the best things, no more annoying lid hunting for those elusive lids that are never where they should be. Just what the kitchen ordered! These elastic edged bowl covers used to be made by a well known company but they disappeared off the shelves after a while. I checked their web site and found they no longer made them. A well known search engine led me to Walter Drake and I am pleased to report I am back in the bowl cover business. They are great quality and great price. so much better than having to unroll and cut plastic wrap. even tho i have purchased the dollar store version of these 'food shower caps', the ones here are colored coordinated, so it's very easy to reach and grab the right size each time! quick fix to a storage problem..no extra bowls to wash. So easy, my husband can use them! These were as I expected. Am happy with them. Great handy items to have for storing food in bowls. I would have preferred that the sizes were color coded so that I didnt have to rummage to find appropriate size for my bowls. Good quantity though. Very useful and cannot find them in the grocery store anymore. Glad you all have them. covers you can see through! use them to cover leftovers in the fridge. everyone can see what is in the bowl and the cover can be used many times. wash in soapy water and rinse. Needn't dirty another container - can put in fridge in serving bowl. The elastic bands on these covers make them fit any size or shape of plate or container, and are faster and easier to use than plastic wrap. Covers will stay in place much better than plastic wrap or foil. Can be rinsed and used over and over. for approximately 10 years I have used these food covers. I would give a perfect score if the set included more of the smaller sizes. Got these because they remind me of ones used by my Grandmother. I'm sure these are much more durable than the ones she used so I'm looking forward to using them. I had a really hard time finding these covers and have wanted them ever since a friend lent one to me. They are great for left overs and for transporting dishes to parties, etc. Been looking for this ! 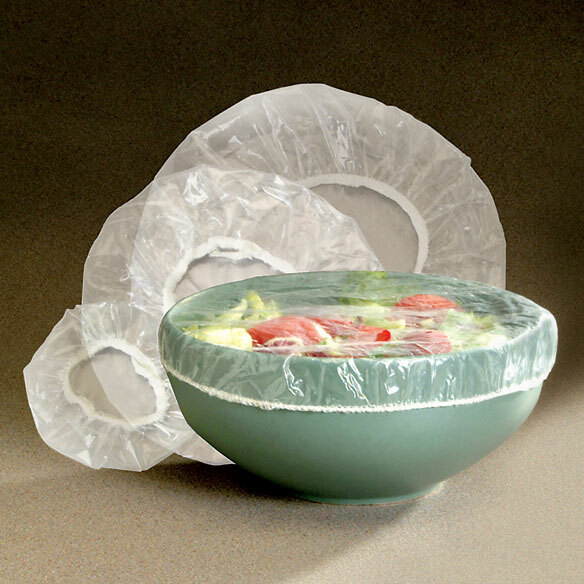 Although it's not air tight, it's handy for those leftovers or taking a bowl to a pot luck that doesn't have cover! It's much easier than getting foil or plastic wrap out to cover left-overs. Just pop this on a bowl or plate and into the fridge. I love the concept of the covers, they are very handy for covering containers that are too full for their own lids and plates with leftovers. I just wish the largest one was a bit bigger. Or that they would include one a little larger in the set. so much easier than looking for a lid that fits. The bowl covers are sturdier than any others I've used. The plastic and the elastic seem much more durable! They were reasonably priced and I am happy with the product. I feel like I am really helping our environment by using these, not plastic wrap. I am using this product for food storage.